Nitro Concepts C80 ▷ Size & Buying Guide on GOTURBACK.UK! There are three types of gaming chairs that make up the Nitro Concepts C80’s line: Pure, Comfort and Motion. These 360° swivel chairs have a rocking mechanism up to 15°. The chair can be locked into one position or left to swing freely. The 5 cm nylon casters have a polyurethane (PU) coating. The most noticeable differences between these chairs are the appearance of the seats and the armrests. In addition, each type of chair has their own unique features in themselves. 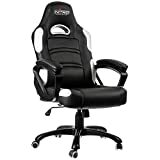 This gamer chair has the distinction of having extra thick moulded foam at a good price point without having to pay for unnecessary features. Enjoy Gaming in a Chair Designed for Its Sole Purpose of Comfort! The breathable imitation leather covers extra padded seating and backrest areas. The backrest is designed to aid the gamer to sit in the middle of the backrest by extra padding protruding on either side of the midsection. This steel-constructed chair offers support for individuals up to 6’ with the adjustable height. The extra padding gives the appearance of a greater seating area. The fixed armrests have a padded width of 8 cm and a depth of 37 cm. Gaming chairs in the Comfort series come in black with a choice of five accent colours of green, orange, red, blue and white, or all black. The upholstery stitching comes in the same colours. The wheels of the casters are designed to match the corresponding accent colour of the chair. The accent colours lie on the outer edges of the backrest and appear on the side edge of the front of the seat. 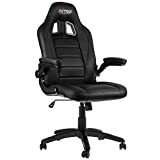 A gamer chair that has upward folding armrests to allow greater seating mobility and comfort. In addition to more padding for contact areas, this steel-framed gamer chair offers great back support. The main feature is the adjustable and well-padded armrests that have a width of 8 cm and a depth of 26 cm. The armrests can be raised upward to 90°. It also has seat-belt openings. 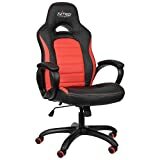 Gaming chairs in the Motion series also come in black with a choice of five accent colours of green, orange, red, blue and white, or all black. The upholstery stitching comes in the same matching colours. The wheels of the casters are designed to match the corresponding accent colour of the chair. The accent colours extend from the midsection of the backrest in a winged shape. The colour is also on the seat top that splay outward from the mid-part of the seat.